The Palladian porch in the memory of eminent orientalist James Prinsep, was designed by W. Fitzgerald and constructed in 1843. It is located between the Water Gate and the St George’s Gate of the Fort William. In its initial years, all the royal British entourages used the Prinsep Ghat jetty for embarkation/disembarkation. James Princep (1799-1840) was the founding editor of the Journal of the Asiatic Society of Bengal and is best remembered for deciphering the Kharosthi and Brahmi scripts of ancient India. A talented artist and draftsman, Prinsep made meticulous sketches of ancient monuments, astronomy, instruments, fossils and other subjects. He was the architect of the opera house, Empire, and also appeared as an armature player on its stage. A friend of Prince Dwarkanath Tagore, Prinsep was and well regarded in Calcutta society for his scholarship and artistic acumen. 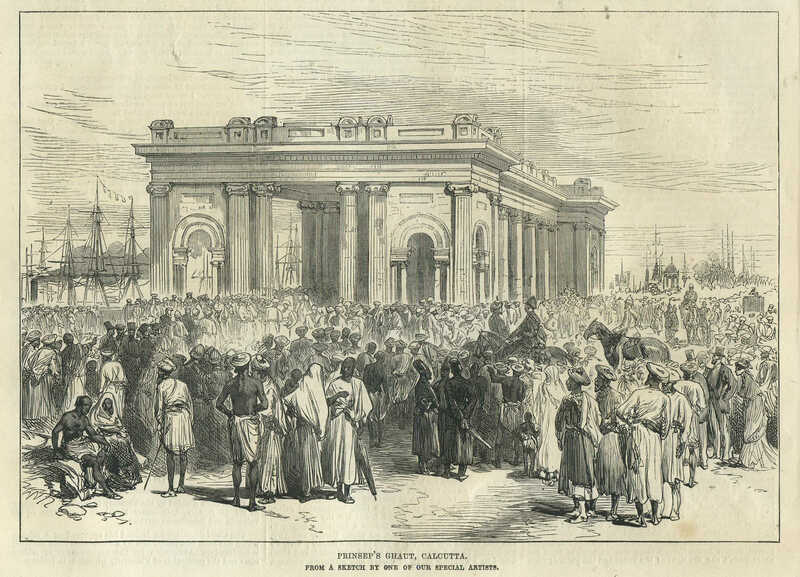 An engraving from a sketch appeared in the Illustrated London News, 1876 by one of their special Artists,. This entry was posted in Uncategorized and tagged calcutta, calcutta ghauts, ghats, jetty, lithograph, old calcutta, princep's ghat, prinsep, quay, waterfront.